Galena. Galena began as an important lumbering center and mining camp. In 1860, R. S. and Andrew Hatch laid out the town and organized a mining district. The Hatch brothers’ quartz mill and smelter were among the earliest erected on this side of the Sierra. 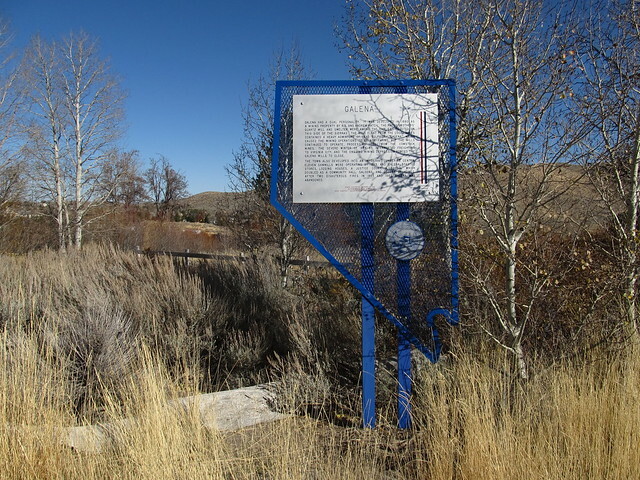 The gold deposits from the local mines contained a lead sulphide named “Galena,” which caused the mining operations to be unprofitable, but the mills continued to operate, processing ores from the Comstock mines.Eleven sawmills were operating by 1863, and Galena boasted stores, lodging houses, a justice court, a school which doubled as a community hall, saloons, and dozens of homes. The severe winter of 1864-1865 interrupted freighting to Virginia City, and the ensuing mining depression forced the Galena mills to close. After two disastrous fires in 1865 and 1867, Galena was abandoned.